I had been dreaming about the line of stamps that I am going to be featuring today for eons and so when I was presented with the opportunity to shine a light on them I grabbed that handle faster than you can think to turn it. Since the theme of challenge this month is: “April Showers bring May Flowers”, it was only natural that the “Water Effects 1” line of design is the collection that I have chosen to splash around with. They yield a 3D quality of such realistic clarity that you will be squinting to see if there really is water dripping onto the project. I created a collection of 6 graphic designs – each design showcases a water effect in a different context with minor tweaks to alter the feel of the water effect. I’m going to show you can recreate each of these designs below with a brief explanation of the technique tweaks applied on each design. 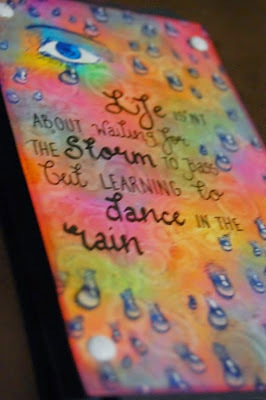 Use a piece of Patterned Wood grain paper or stamp a woodgrain pattern on a piece of cardstock. 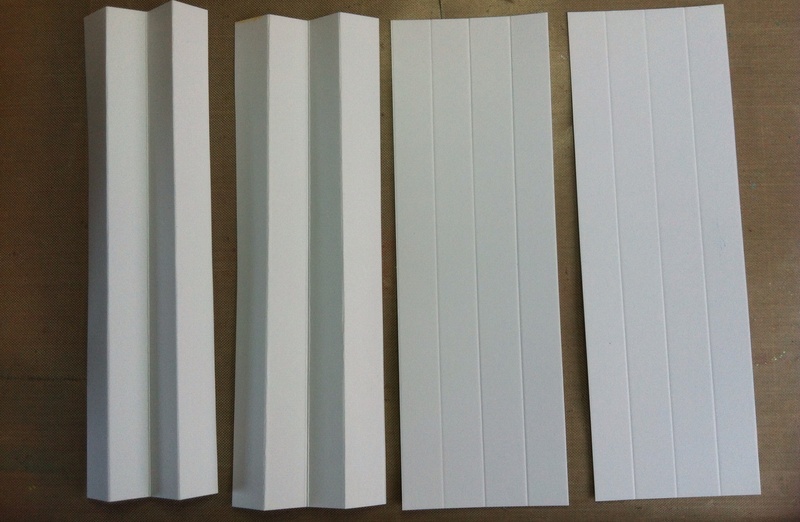 To create the plank or shingle effect fold the paper into strips and ink on the mountain fold join. 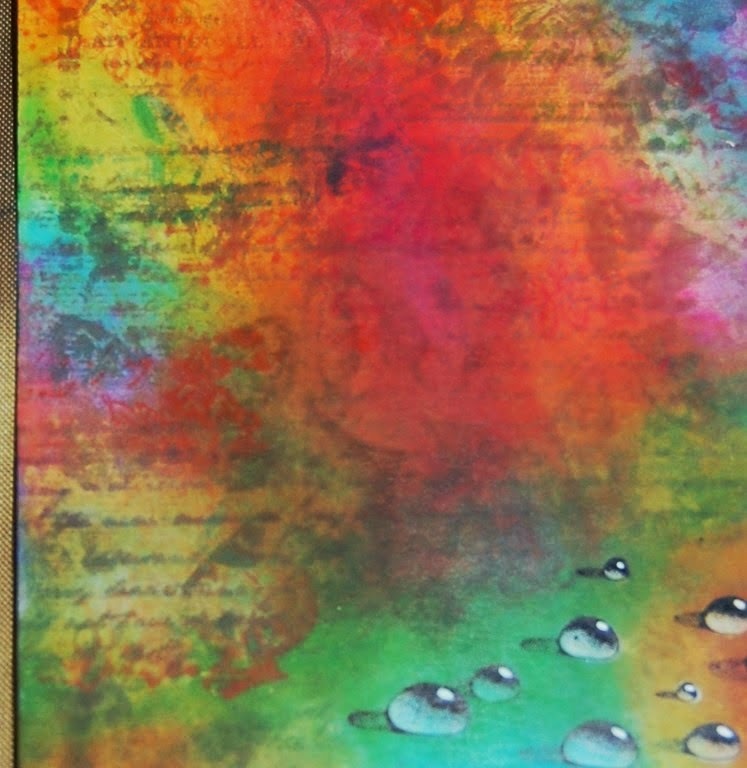 Use the “Water Droplets” stamp and stamp the pattern all over the “planks”. 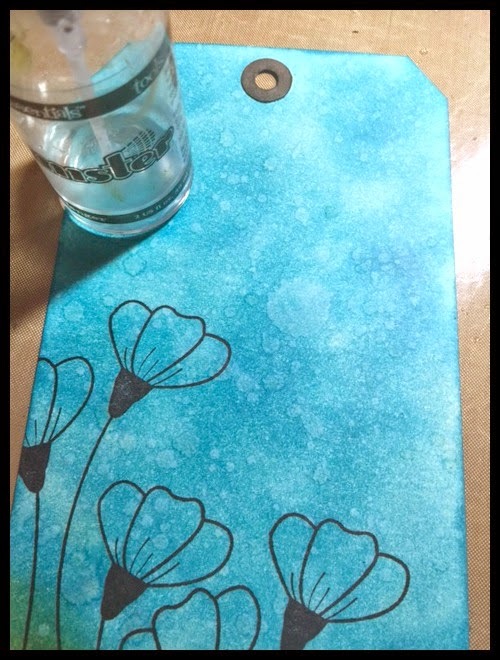 Make a translucent white wash by swiping white Picket Fence Distress Stain on your craft mat and misting it with clean water. Use a small detailing brush to pick up some of white wash and paint in the clear parts of the droplet. Ideally the more opaque white should be at the heaviest tension of the drop. You may apply “Glossy Accents” to some of the drops just to give it some extra texture. Die-cut Maple Leaves from textured handmade paper. Ink the edges to create shading. Use a Viva Decor Transparent Paper Pen to create the dimensional drops on the leaves. 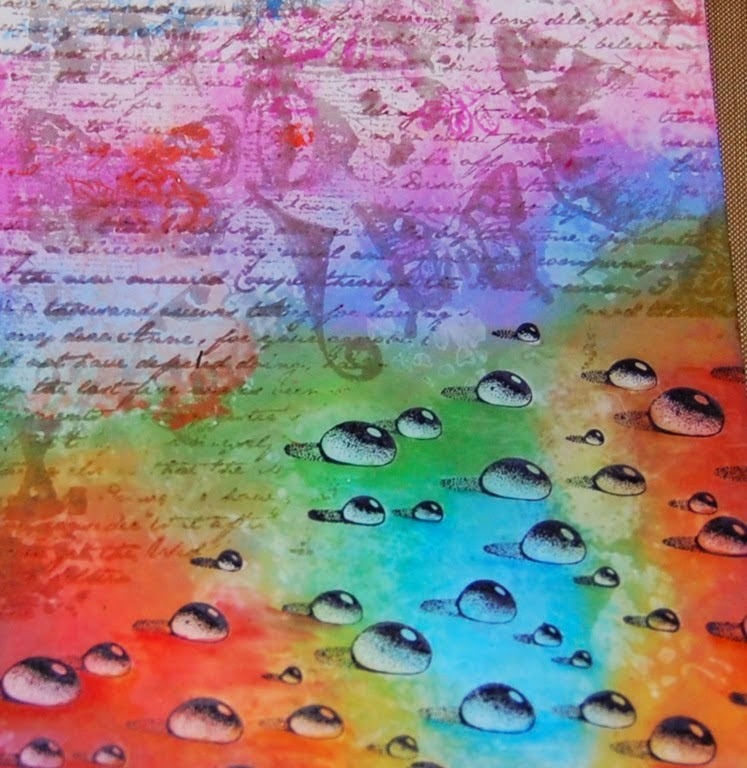 How fabulous is it that the same “Water Droplets” Stamp also created this gem texture. 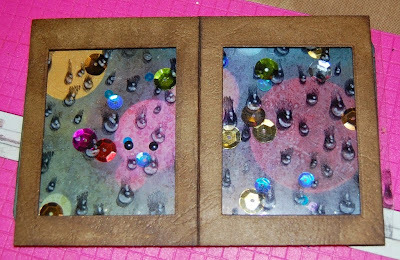 Stamp a strip of gems on the right hand side of a piece of Ranger Stamping cardstock that you have colourwashed in neutral sandy tones. On this card Antique Linen, Bundled Sage, Tea Dye and Frayed Burlap. Colour in the “Water Droplets” in rich, intense jewel tones with Distress Markers. Make it as dark as the cardstock will absorb. Now you want to do the opposite of what you did with the white-wash. Dip a Fine detail brush in water and washout some of the bottoms of the drops (where the tension is the heaviest). Leave it darker at top. Washout the reflection highlight at the top of the drop as well. Write or stamp a sentiment on some scraps of Balsa wood or chipboard. 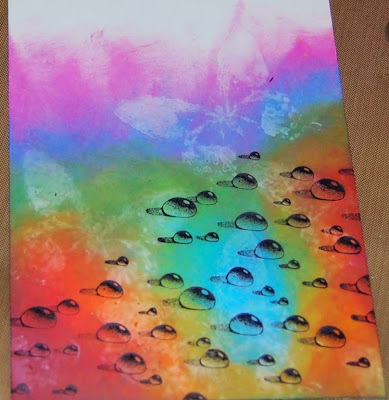 Using the “Sideways Droplets”, mask off how much you want and stamp the drops onto the balsa wood. Use a permanent marker to colour in the drop. 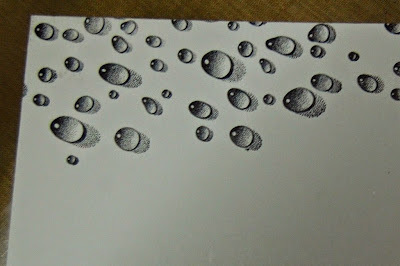 Add a generous amount of “Glossy Accents” to the drops to make it dimensional. 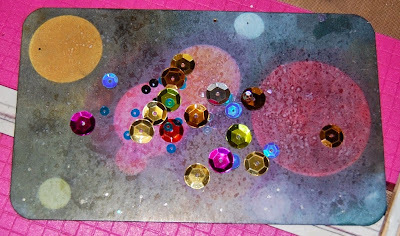 Use a Viva Decor Translucent Paper pen to create the “gems” on a craft mat. Colour the underside of each gem with a permanent Marker. Glue in place with “Glossy Accents”. 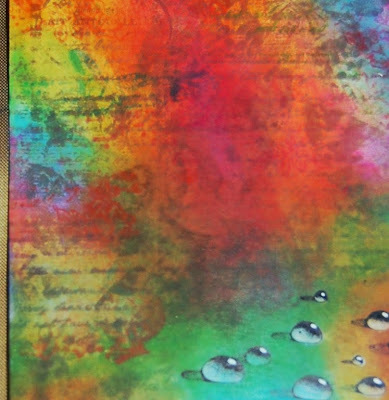 Create the whimsical bubbles on this design by using the “Rising bubbles” Stamp from the “Water Effects 1” Collection. 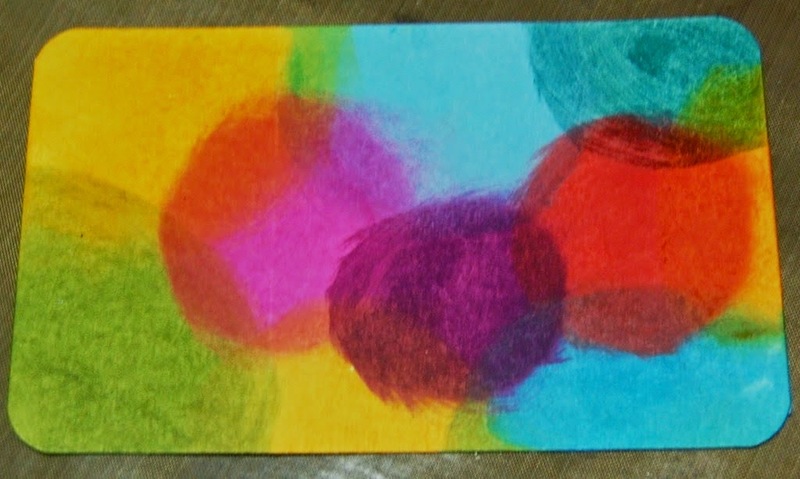 Colour inside the bubbles, blending as much as you wish with Distress markers. To get the bubbles to really pop up – apply a generous layer of Glossy Accents to each bubble. 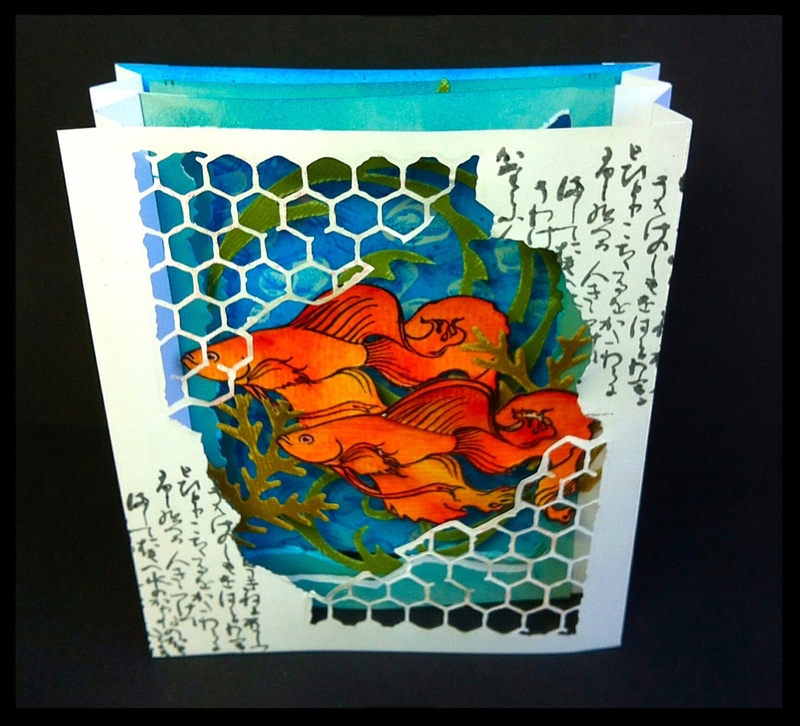 The awesome Ukiyo-e like wave texture in the background was created with another Designs By Ryn (“Sea Bubbles”) stamp. Add a strip of vellum over the top right of the background piece. Use a white permanent marker to draw in cloud shapes and wind swirls on the reverse side of the vellum. Write in a sentiment on the “cloud”.Die-cut Feathers and individually colour those. You may want to add some more texture by using a 0.7 black gel pen to accentuate the grain of the feathers. Begin by creating your background by first stamping your sideways droplets offset on the right hand corner in Archival Ink. Swipe Ripe Persimmon, Picked Raspberry, Mustard Seed, Mowed Lawn and Salty Ocean Distress Ink directly onto the cardstock and blend together with an overswipe of Spiced Marmalade Distress Ink. 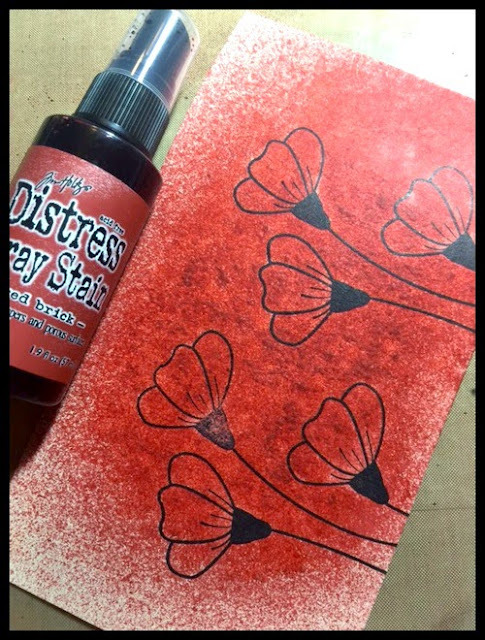 Spritz a butterfly stamp with clean water and create artsy water stains by stamping it on the Distress Ink saturated background. To create the effect of realistic 3D clear droplets, Dip a bullet nibbed Fantastix colouring tool in clean water and wash out the inside of each bubble. This will leave a washed out hint of colour that's lighter than what is around it. To really make it shiny – take a white gel pen and add a highlight to the reflection at the top of the bubble. Add Ribbon, Baker’s Twine and butterfly die-cuts to embellish. Add wire forms to create more interest. This was done in pretty much the same way as the technique walk-through of the previous one so I am not going to make you read the same instructions again. The bits to remark on though are the crying eye effect. You start by inking the small Hanging Droplets stamp. Choose the size teardrop you want and mask off the rest. Stamp the teardrop. This makes it easier to position the eye in the appropriate place. You could also have a tear rolling out the corner of the eye. It’s up to you to cry where you you like! Mask off the centre or the whites of the eye and saturate your background with loads of psychedelic hippy colours. Use a retro circles stamp spritzed with water to lift some of the ink off. 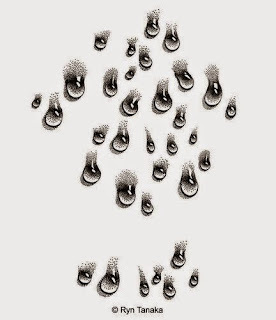 Stamp the rest with the Large Hanging Droplets over the inked background in Archival Ink. 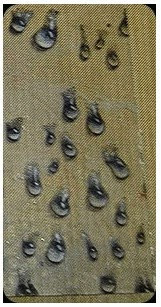 Now you can washout the inside of the drops and highlight the reflection at the top of the drops with white ink or a white gel pen. Stamp or write your sentiment where you want it. This adorable window shaker card would have been effective and gorgeous as is with the Bokeh Effect outside the window and all. But what really brought it to life was the HANGING DROPLETS on the window panes right? This one was a bit more technical than the rest. So here is a little step-by-step to help you find your light shaker too! To create the rainy window panes you are going to need a piece of acetate, Stazon Black Ink and a white permanent marker (I used a Centropen Marker). 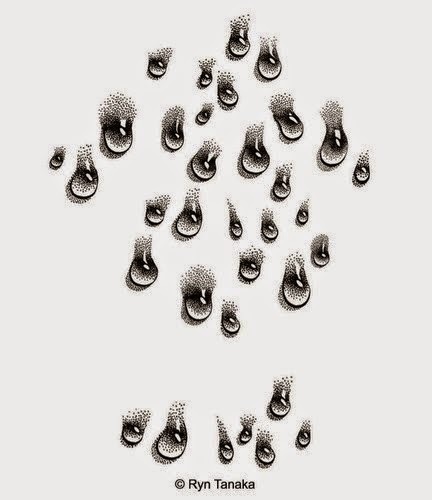 Stamp the Large “Hanging Droplets” all over a piece of acetate with Stazon Permanent Black ink. When it dries, use a white permanent marker to colour in the drops on the reverse side of the acetate. Creating the Bokeh Background involves inking up a piece of glossy cardstock. Die cut circles in different sizes and lay them down in the Light Pattern that you want so that the circles create a mask. 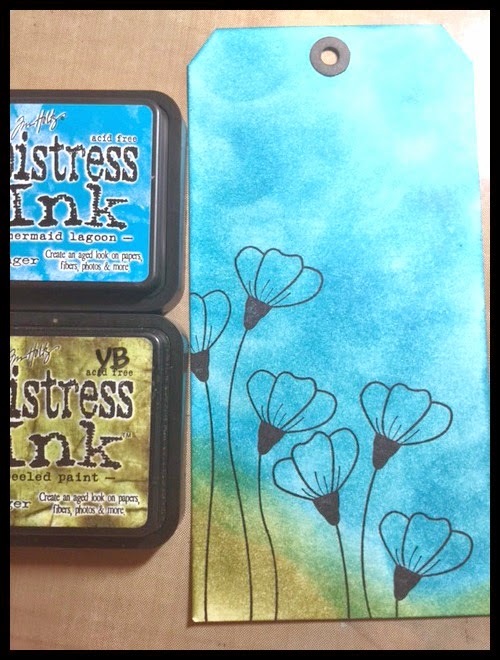 Use Black Soot Distress Ink to ink up the whole background. Remove the the Mask and you have a gorgeous light pattern. 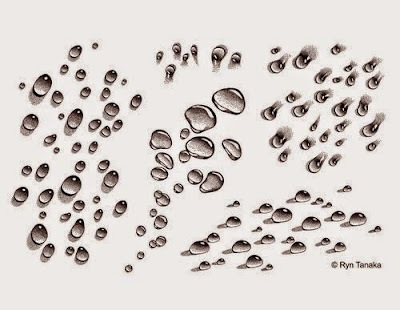 Lightly mist with Water to create speckles. Wash some of the colour out in the Bokeh Circles if you want a more glowing light pattern. Add your other sparkles and sequins and put together your shaker card. 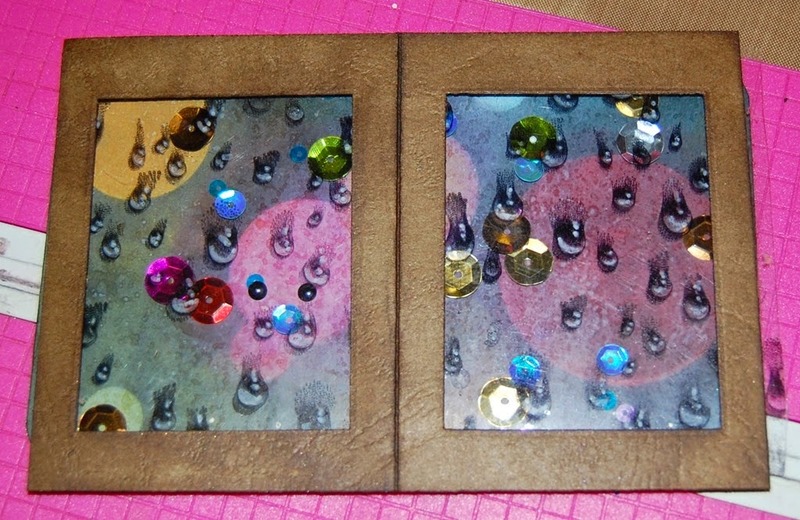 Add all the other embellishments to the window frame and stencil a brick texture for the background. I wrote in a sentiment but you can stamp one in if you don’t trust your handwriting. Aren't these stamps just the darn awesomest? It was all kinds of fun creating these different effects to make the most of this collection and I am already bursting with even more new ideas I have for them, but I will have to stop here for now. 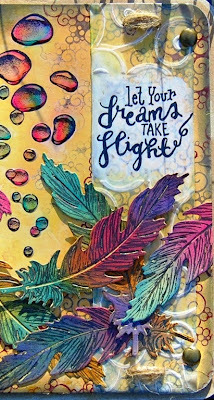 I hope that you will "drop" by and play along with Shari's challenge this month since DESIGNS BY RYN is sponsoring some magnificent prizes and the Water Effects Collection that I used to create these designs are included in the prize loot. 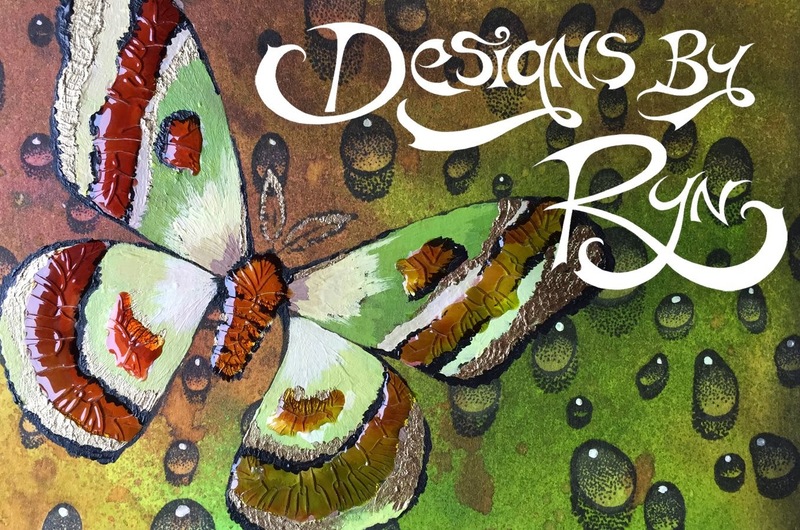 Jan here, Wow, I am delighted to highlight our amazing sponsor for May - Designs by Ryn. I love her stamps. They are so unusual, detailed and stamp perfectly every time. I was able to choose which stamps I would like to use. YES, I got the bubbles, water drops and the gorgeous fish. 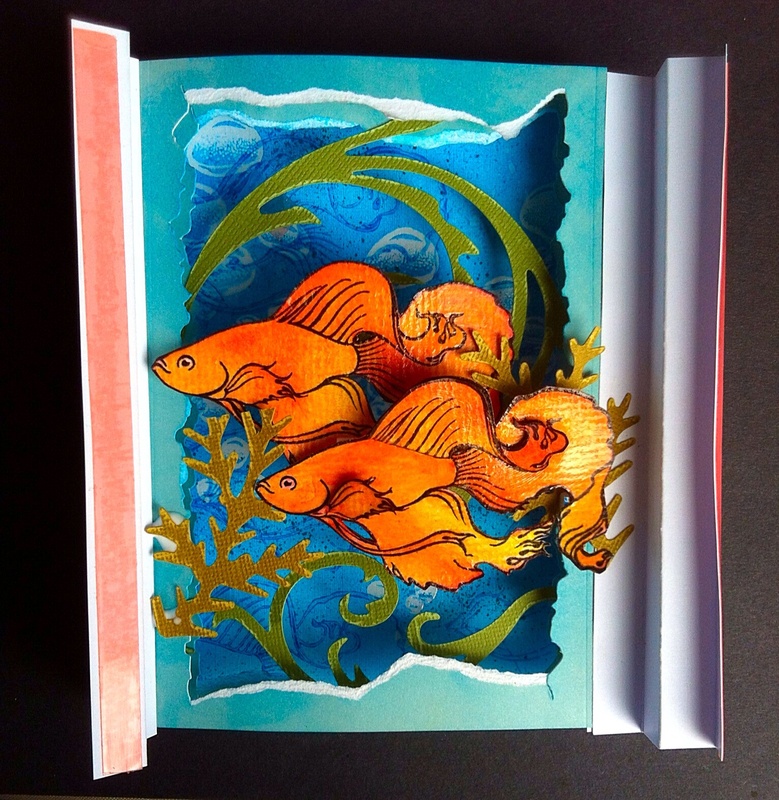 I decided to create a diorama card, for the fish to swim amongst sea weed and coral. It was very fiddly because it was my first attempt at 3D paper work. This is how I made the card. The background was stamped, embossed and inked. The bubbles were embossed with white opaque powder. The fish was stamped with Mermaid Lagoon and a background of blended DI. 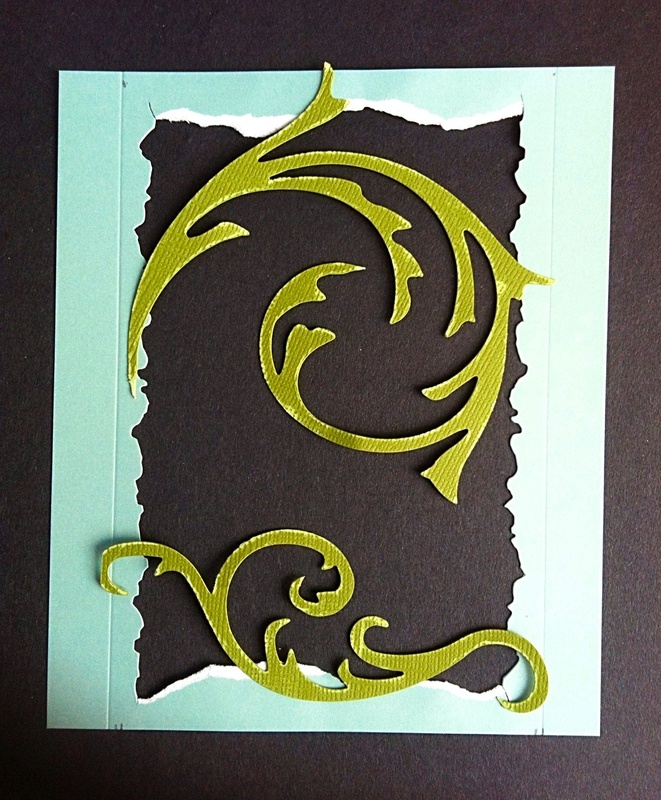 The second layer, using coordinations paper, die cut with TH Elegant Flourishes to create seaweed. 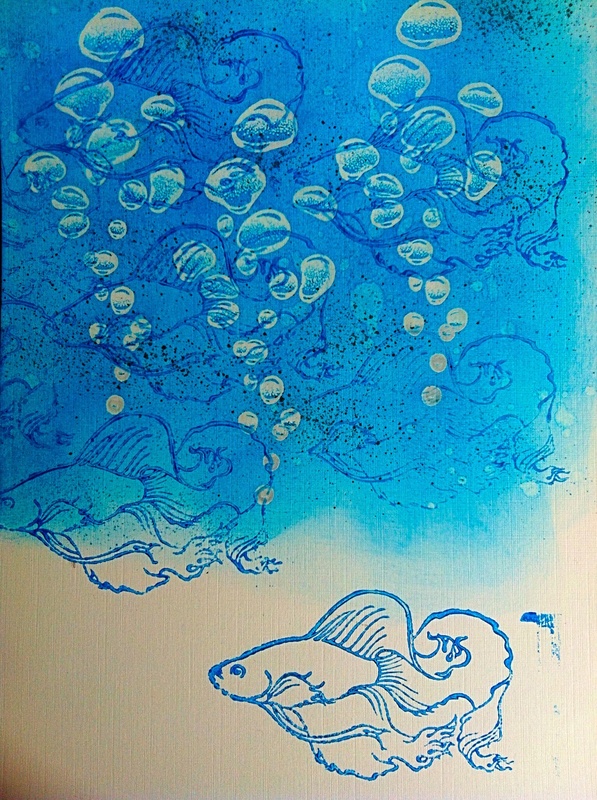 I stamped and embossed the fish on watercolour paper and cut them out. 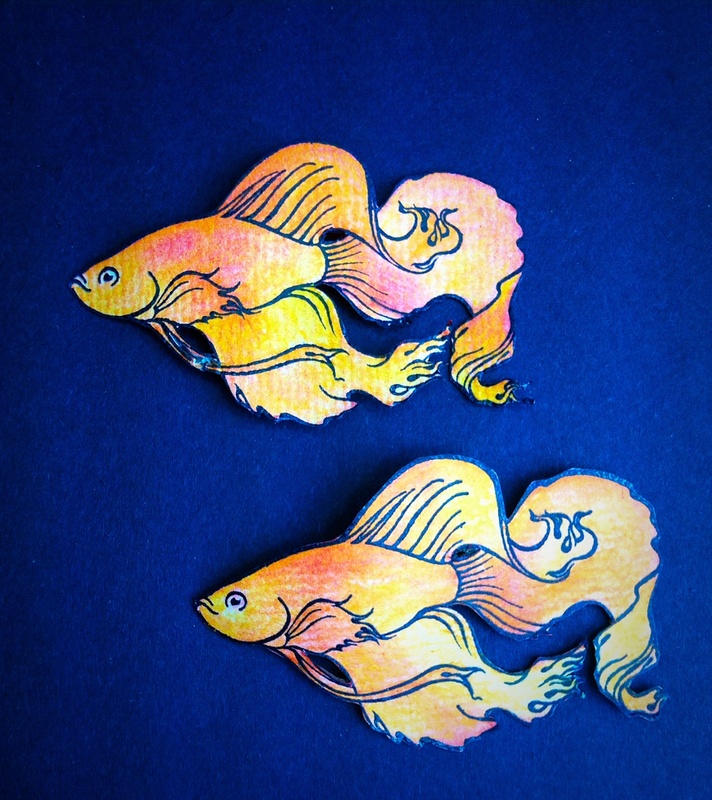 I coloured them and added fussy cut layer fins and tail to the front fish, then added Glossy Accents. I scored and folded the sides of the card and then added the layers with slots at the side. Sorry I forgot to take photos of that part - very fiddly! 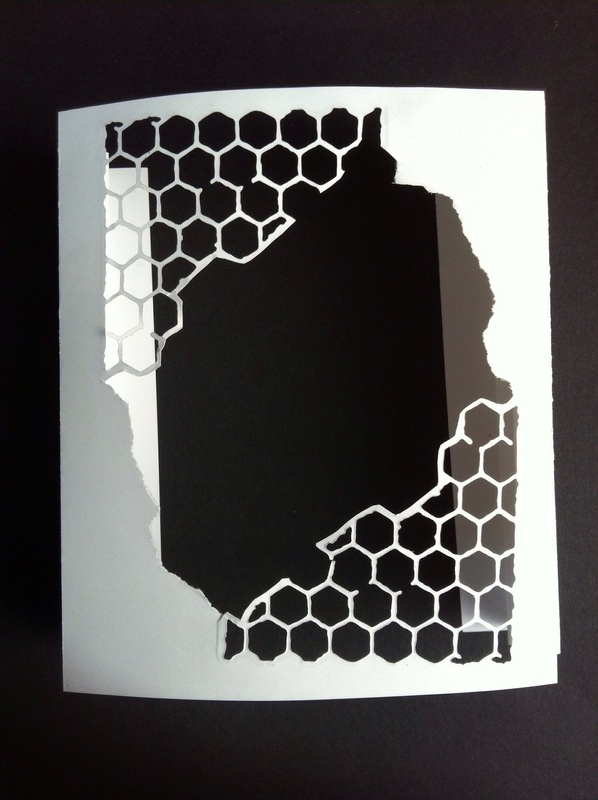 The three pieces were layered with double sided tape to the folded sides. It looked quite bare so I added more seaweed using Tattered Pinecone leaf die. The top layer was die cut with TH thinlets to resemble coral. 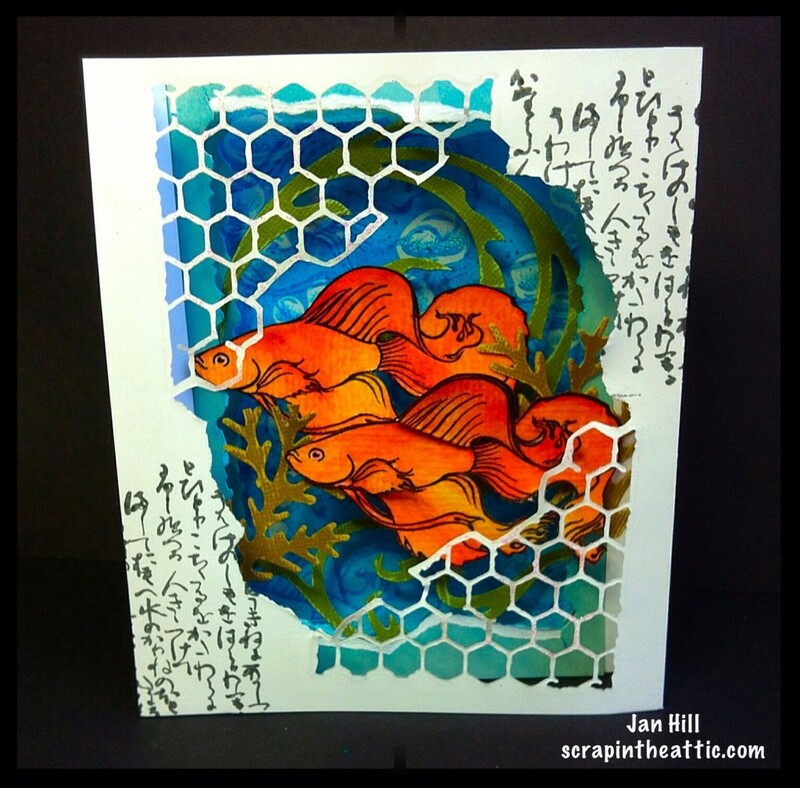 I stamped some oriental text on the top layer and added Rock Candy Stickles to the coral. 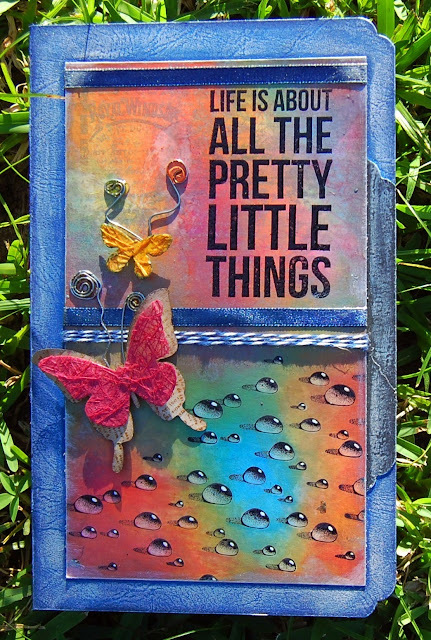 I was really pleased with how the card turned out, I hope you will be inspired try Ryn's stamps, they are beautiful to use. 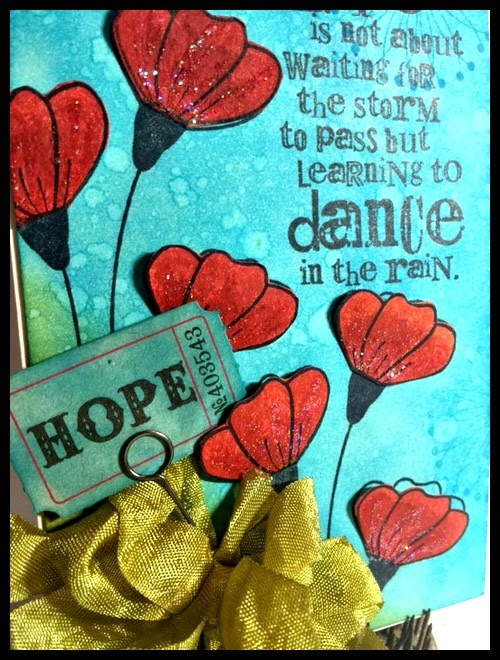 Join Shari's April Showers brings May Flowers challenge and you could be the lucky winner of a Designs by Ryn prize! There will be another spotlight of Ryn's stamps here on the 19th May! Don't miss it! If you don't know Yvonne, you should!! She's a multi-tasking artist extraordinaire to say the least. I don't want to give too much about Yvonne away but, if you're lucky enough to live in The Villages, Florida-USA, you may find Yvonne at her art and scrapbooking supply store 'She Scrapbooks & More'. 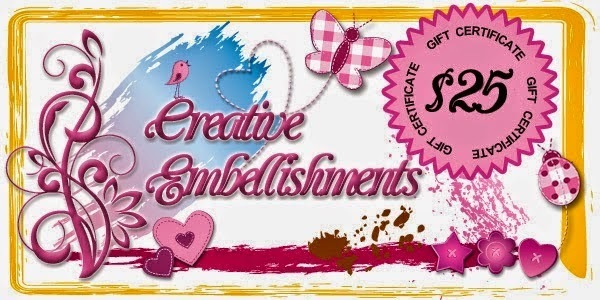 Yvonne also travels the nation teaching her brand of creativity and just this year, at the CHA Megashow in Anaheim, California-USA this year, Yvonne released her own line of Quirky Girl Stamps through Impression Obsession! Hello all! 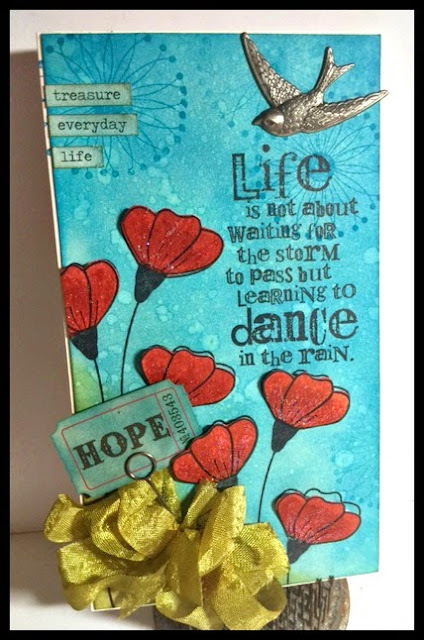 I would like to say thank you to my friend Shari for inviting me over to "Our Creative Corner" to play along with her challenge of April Showers brings May Flowers! So here is a little card I made in honor of the challenge...I hope you enjoy. 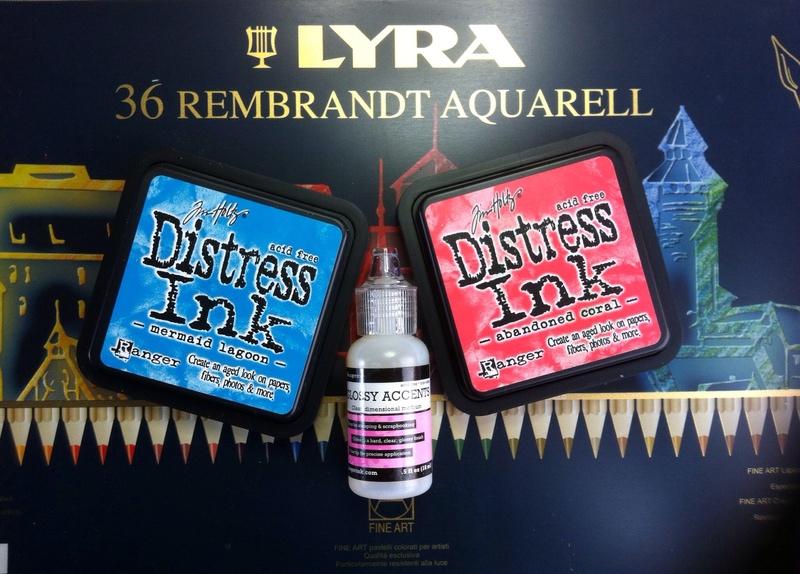 Distress Ink is definitely my medium of choice...I love it. It is, I think, the most versatile ink on the market. You can do so many wonderful different techniques with it. I started off by stamping my Poppy stamp onto a tag with Jet Black Archival Ink. Didn't worry about the flowers because we are going to layer on top of them. Once it was all inked up and blended out I then used the famous "spritz and flick" technique from Tim Holtz. If any of you aren't familiar with it you spray some water into your hands and turn your hand over quickly and "FLICK" the water onto the inked surface. You get these lovely little water marks. (this represents April showers for me, wink) and it just gives it some delicious texture and dimension! Next,stamp some more Poppy's onto another tag or manila surface. Then take some Fired Brick Distress Stain Spray (boy that's a mouthful) and Spray the Poppies...I really don't worry about being neat here at all, lol. I think everyone should have Crystal, Diamond and Star Dust in their stash, hehehe. Those are the ones I reach for all the time! Let that dry and then "fussy" cut the Poppies. 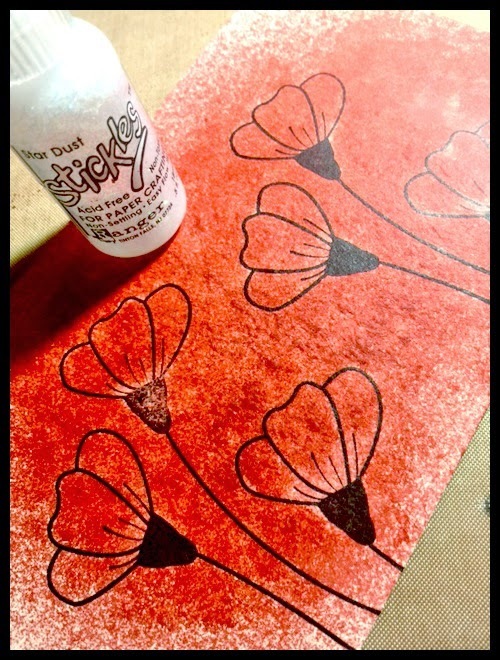 Next,you will adhere those fussy cut poppy blooms with a pop dot near the top and flat to the card on the bottom of the bloom. This gives it a more realistic dimensional look. I love to dye seam binding too. I buy it in the 100 yard spools. I used Peeled Paint Distress Stain Spray, sprayed it on my craft sheet, added a bit of water and rolled the seam binding around in it. Then I take some paper towels and crunch it in a ball. This takes out the excess moisture as well as adds some nice crinkles to the ribbon. Then dry with a heat tool and create a bow. Adhere that to your card. I stamped some Dandelion Balls in the same Mermaid lagoon to add a bit more to the background. Colored a ticket stub, adhered the bird and then adhered the whole piece to a card. 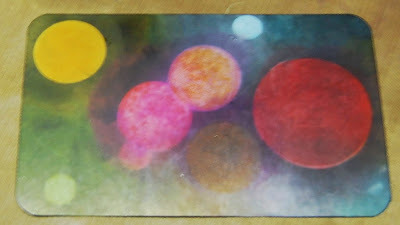 The card background was 8 1/4 x 8 1/4, scored it at 4 1/8 then adhered my tag to the card foundation. The tag itself is 4 x 8. I hope you enjoyed my version of April Showers brings May Flowers! I so enjoyed the opportunity to be a guest designer here at Our Creative Corner and thank you for letting me come over and play! Now, I hope you will get busy and join in their Challenge FUN!!! Go on...Go get creative! wink. Holy Moly, Yvonne!! 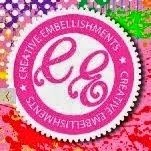 I do believe it is we at Our Creative Corner who are honored to have you here as our Guest Designer this month! Thank You for this incredible and vibrant April Showers Bring May Flowers creation! I love it!! We're barely at the half way mark for this month's challenge. 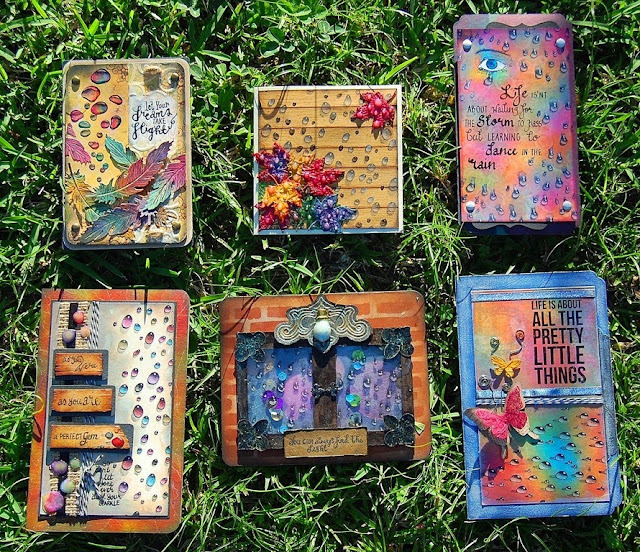 You've got plenty of time to create and enter your April Showers Brings May Flowers project. The link closes on May 28th at 11:55pm GMT. Hi everyone! Laurie here to bring you the winners and Top 3 from my April challenge. I was so excited to see so many wonderful entries celebrating spring or the splendid colors around you for this challenge “Color Your World”. There were so many creative projects that choosing just a few was extremely difficult. They have a $25 gift certificate for our randomly drawn winner this month! 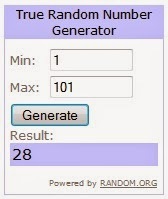 The lucky winner selected by Random.org is…. Please email us via the email link on OCC and we will get your voucher code to you asap! 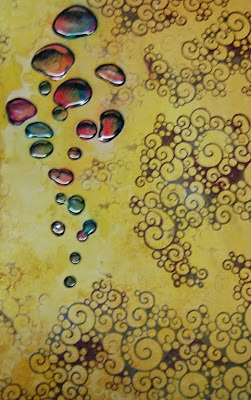 My winner Suman blow me away with her use of watercolor paints, texture paste, and acrylic paints with stencils. The stunning flowers just popped right off the page. What a delight for the eyes with all the fabulous details. Thank you Suman for showing us how you “Color Your World”. Athanasia Papantoniou embraces the challenge for colors in her work with such beautiful style. I adore the whimsical look of this canvas as the little girl dances with the delight of Spring. Joi has a bright vibrant style happening on this canvas. She added a colorful flowering tree and texture on this springtime background. If you peek below the tree you’ll see cute little bunnies and an adorable puppy. This creation says springtime to me. Rupa has so cleverly created her own spool from empty brown tape rings and old CD’s to incorporate it into this wonderful spring piece showcasing her adorable family. 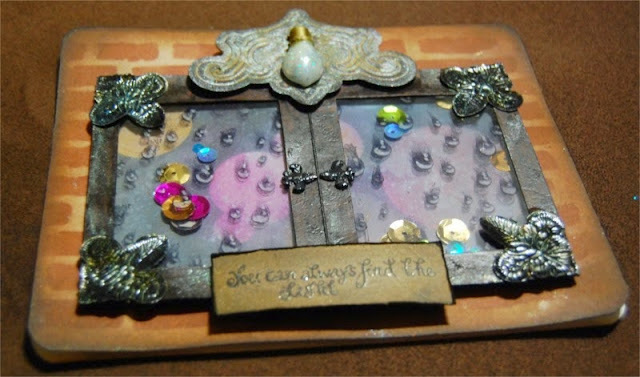 Lots of beautiful details to see in this altered project. Thanks so much to all who entered the April challenge. There were so many more I would have loved to feature here today. I must say I truly enjoyed seeing all the spectacular entries. What a wonderful thought that this world is so colorful and filled with so many creative people like you who inspire us! Why not join us and you could be our next month winner or Top 3! Just hop over to Shari’s challenge “April Showers bring May Flowers” and have a go! 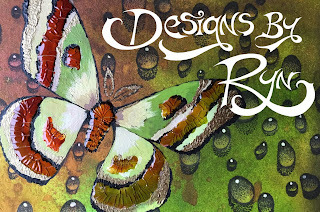 You could even win a fabulous prize from this month's sponsor Designs by Ryn!